You can see there are fields for Reserve Range and Estibot Valuation. If the auction does not have a reserve price, the reserve range field does not show up. The backorder details page also reveals whether or not a Pre-Release Auction will be public or private. 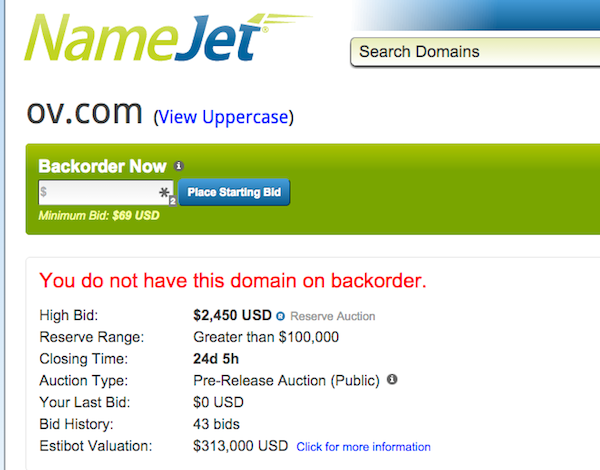 I am glad to see the reserve range field on NameJet auctions. I think it is good to know whether or not I am close to hitting the reserve price when I am bidding. Most other live auctions have the reserve range, and this addition makes sense to me. The Estibot valuation is going to be interesting. I generally find the Estibot values much greater than I would be comfortable spending on a domain name. I would imagine the thinking is that it could spur more aggressive bidding, but I don’t know how much consideration people in the industry will give to the Estibot values. Personally, I like to see that a domain name I like “has life” and has a reasonable Estibot value. I am sure I have paid more than the Estibot value on some domain names though. Some domain sellers may take issue with Estibot valuations being listed on the auction page. The valuable 2 letter domain name OV.com is coming up for auction on NameJet in a little over 3 weeks. OV.com has an Estibot value of $313,000 listed on the auction page. Correct me if I am wrong, but I think the current floor price for LL.com domain names is higher than $313,000. Since this is a private auction, the domain owner might not be so happy that there is an automated appraisal on the auction page that is lower than what its actual value is today. “As to the recent changes on the NameJet website, we want to make our platform as easy to use and informative as possible. So we updated our Backorder Details pages and Auction Details pages to now include (a) reserve ranges; (b) whether an auction will be public or private, and (c) Estibot valuations, along with a link to Estibot’s website for more data. Please note that you may need an Estibot account to get the full range of information they provide on their website. We added these data points because we think that our customers will find them to be useful. The most interesting addition, and the one that will likely generate the most conversation, is the Estibot valuation data. Domain name valuations can be very subjective and based on a large number of factors. And while an Estibot valuation may not always match what a domain sells for, it can at least provide a reference point. Plus Estibot provides a great amount of additional information on each domain that our customers can find helpful. Estibot is one of the most popular and well-known domain tools in the market, and we want our customers to have easier access to this kind information to help them research and assess domains they are interested in. Shane Cultra also mentioned the changes, and he shared his thoughts about them. I am curious what you think about the changes at NameJet. I think adding estibot values is a bad idea. estibot is not a good indicator of value. its just going to mislead people one way or another. sad day in the domain industry. New investors will get screwed. Estibot valuation is a joke and this NameJet’s innovation is a huge mistake. I’m glad Elliot, that you have picked OV.com as a example here. When you go to Estibot.com for details of OV.com valuation, you will find out that OV.info and OV.us are available (sure they are not available) and that related most recent sales are in range $186,000 – $245,000; lowest is TS.com (Sedo, $186k; 2011-02-04) and the highest is FO.com (DomainAdvisors, $245k, 2012-05-31). MediaOptions should not be happy about this innovation as well – their domain name 742.com has Estibot valuation of $30,000. Why to pay more, right? OV.com has Estibot valuation of $313k, because this useless tool works with wrong data. It says that OV.info and OV.us are available domain names, even those names are blocked/reserved and not available for registration. Estibot uses other extensions availability as a factor of popularity such keyword. Another factor is google search information, which is again misleading. And one of very important factors is recent sales information. Here, Estibot is again blind, reporting recent sales in the related category being in range $186,000-$245,000; the lowest is TS.com ($186,000 – Sedo – Feb-04-2011), the highest is FO.com ($245,000 – DomainAdvisors – May-31-2012). Well, sales from 2011 and 2012 are surely not most recent LL.com names. Most recent reported names are close to $1M, and those unreported are way above. They should hire “Dino” and the other Chinese QXJZ pumpers that spam my mailbox daily for non-QXJZ letters offering $300 a pop. Showing the estibot value is dumb. And it can be confusing at a quick glance compared to the bid. And how about making the distinction between expiring domains and private auctions for NJ’s PreRelease domains. I’m so sick and tired of it being mixed. Expiring domains and private auctions should be in separate categories anyway. Estibot is for newbies. Don’t fall for this “appraisal scam”. This is stupid. Who idea was it to add estibot? I’m not fully decided. But my initial reaction to seeing the Estibot numbers alongside NameJet auctions is … that it will make very little difference to the outcome. Here’s a question for those of you who’ve spent a lot of time buying and selling domains: Who is it that quotes estibot values to you? Buyers or sellers? How serious are they? How experienced? In my experience, end-user buyers rarely rely on automatic appraisals. They know their budget. They know how much they want the domain. If they’re spending a lot of money, then they aren’t going to believe a robot; they’re going to talk to an expert, do their own research, or believe nobody and trust their gut. Maybe a buyer might throw an Estibot valuation into negotiations hoping that it will make the seller lose confidence in his own valuation, but that tactic can’t be applied to an impersonal auction where there’s nobody to negotiate with. The people who’ve mainly thrown Estibot appraisals at me are inexperienced domainers with something to sell me for more than it’s worth. At that stage, the seller is rarely ready for a real transaction. Those of us who bring medium or large budgets to bear on auctions have been around long enough to ignore estibot and rely on our own hunches and/or research. Naïve domainers who cling to estibot valuations are seldom spending much to acquire domains. They don’t pay estibot amounts when they buy; they merely quote estibot amounts when they’re trying to sell. Perhaps end-user buyers who have responded to emails sent out during a NameJet auction will visit the site and see estibot valuations. Will that impress them? I doubt it. They’ve already heard from a robot spammer or a person. And either of those would have explained the domain’s value sufficiently well to get the buyer involved. But maybe Etibot valuations WILL be taken seriously by end-user bidders. Either they’ll see a low valuation and back out (which is good for domainer buyers), or they’ll see a high valuation and stick around (which is bad for domainer buyers). I’m considering putting a few domains up for auction at namejet and am very happy with the addition of the estibot valuation figure to provide at least a starting point for a prospective bidder to consider as part of their overall valuation process. This will never change, everyone pest about Estibot but everyone go there (or at Valuate.com) to get a fast value estimation. It’s far to be perfect and this is why they continue working to improve it, but until now there is no better automated appraisal tool (it’s the reference for near a decade) so NameJet.com made a good move there, people will save time. It’s laziness Francois, to use a simple bot. There is no other way to value a domain other than put your own effort into data and analytics. Although it’s a gimmick for namejet, no one with any integrity will respect them for it. It’s not about laziness, it’s about efficiency, there are dozen thousands dropping names each day, only an automated tool can give you the opportunity to estimate so much domains in a so short time frame. It’s up to you to eventually do your own research on the few ones you decided to bid. By the way Dropping.com may help you a lot to sort valuable domains and/or the ones you should like. I have dropped a domain which was appraised for $ 450,000 by estibot . I could not get a buyer for any price. Not even for $ 200. I had a domain appraised by estibot for $ 360 which I sold for a nice $$,$$$ amount. It has some entertainment value. Nothing more. What domain did you have that was valued at 450,000 by estibot? do you still have it. I dropped it few years ago. I will dig into my old excels and will let you know once I find it. Liquidity and appraisal are two different things. What you comment happens all the time. At least this gives a starting point. The buyer if a bargain hunter can start with the Estibot value if it is low and the seller if they think they hold gold can start high. Isn’t the issue with most sales, nobody knows where to start. From that angle this is a very clever idea. Although the claim may be that the inclusion is to provide additional domain info, I suspect it’s really there for a more straight forward affiliate income relationship. I looked at a couple random last chance listings, like CFCU.com deciding if I wanted to buy for Communications Family Credit Union and unless I’m wrong the affiliate id is 13731. Looked at another P4.com and shows the same. Just a theory. Doesn’t matter.